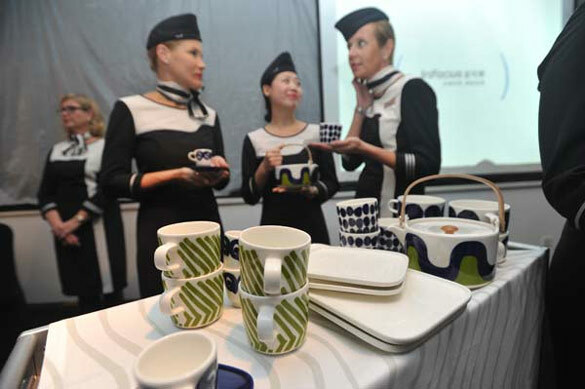 Following the completion of Helsinki Airport’s two Finnair lounges as well as last year’s introduction of new cabin crew uniforms by designer Ritva-Liisa Pohjalainen, Finnair has unveiled the third phase in its design revamp. 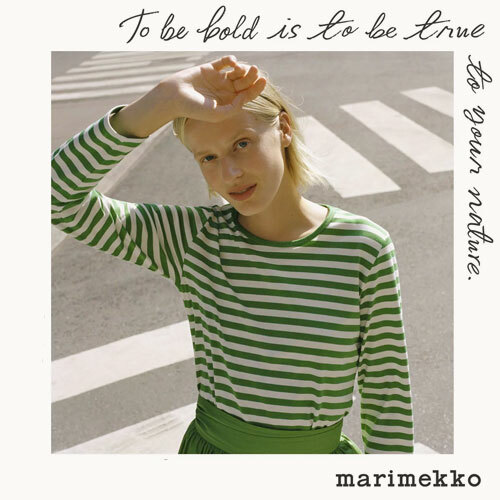 And who better suited to supply the airline with textiles and tableware than iconic Finnish fashion and homeware brand Marimekko? 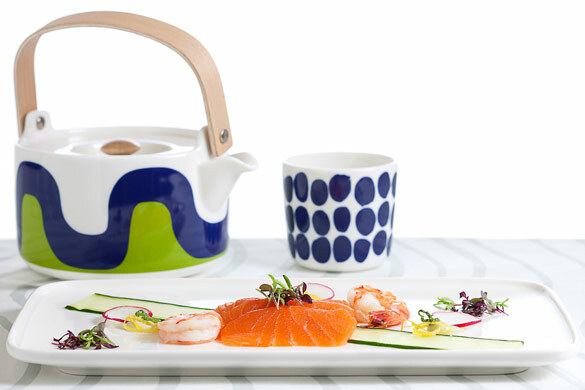 As of spring 2013, a clean and playful new collection of mix-and-match plates, bowls, cups, napkins and tablecloths, all featuring Marimekko’s classic prints originally created by Maija Isola in the 1950s and 1960s, will be in use on all aircrafts. ‘We wanted to use prints that are very Marimekko, but not the most obvious ones’, explains resident designer Sami Ruotsalainen, who, alongside Isola’s daughter Kirstina and granddaughter Emma, picked out and adapted designs such as ‘Stones’ and ‘Great Crested Grebe’ for the new line. ‘The patterns reflect the freedom of flying. The colour scheme brings to mind the calm blue, green and white-gray tones of the Finnish lakes and landscape that one can see when looking down from the sky’, says Ruotsalainen. 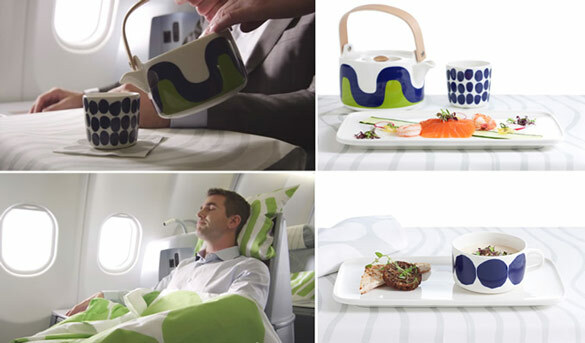 Aside from adding a touch of grace to the business class cabin, the lightweight porcelain (which weighs between 10 and 20 percent less than the previous tableware) will also lighten the airline’s carbon footprint. Those stuck in economy need not worry – they also contribute to reducing greenhouse gasses by enjoying meals from matching featherlight paper versions. A more familiar Marimekko pattern is that of ‘Poppy’, whose large, splashy blue flowers were chosen to adorn the livery of two of Finnair’s long-haul aircrafts that operate between Helsinki and the airline’s Asian destinations.